This image is a free digi from the incredibly generous Sliekje. She shares all her digis free to those who want them, and they're all adorable! She gives us a gift every time she posts a new one, and she really has the talent to create some cuties! I saw this and thought of my granddaughter since she loves to pull her little sister around in a wagon, so this one is going to her. I colored the image with Copics and found a remnant of some old Valentine DP and a few snippets of left over ribbon. 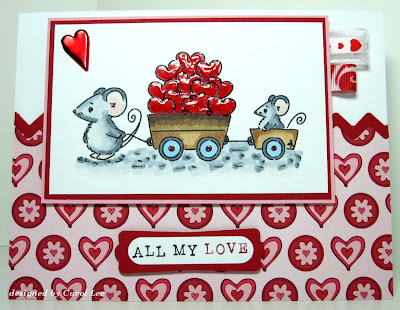 I added glossy accents to the hearts and stickles to the wheel centers. The zig-zag border was done with an EK punch, and I added a heart brad for interest. The sentiment is by SU!, done with SU! punches. 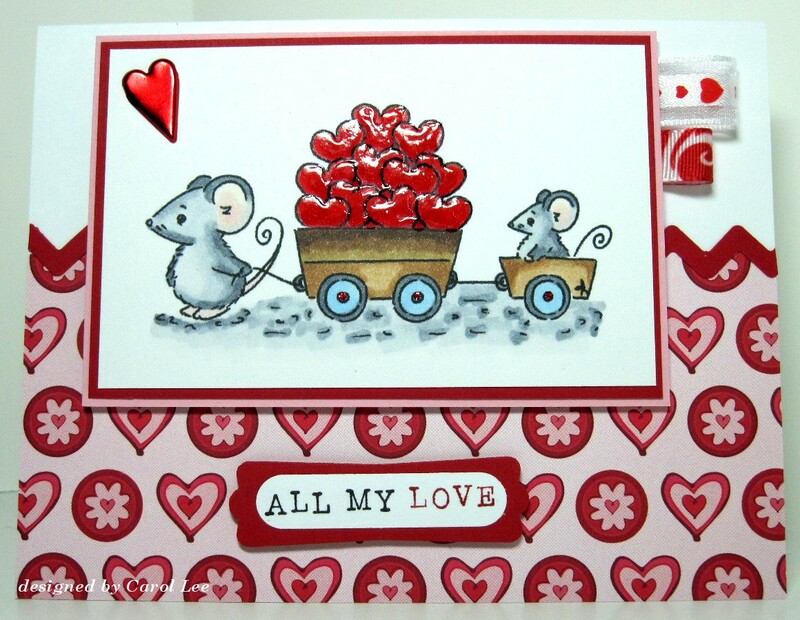 Such an adorable image and I love the accents on the hearts! AWWWW...Carol this is over the top cute! Love the image and especially the hearts!!! The glossy accent really makes them pop :)!!! I love Valentine and making pink/red cards :) !!! awwww, that image is so ADORABLE!!! Cute cute card! What a fun freebie and a darling card! Hey, I downloaded this one! Thanks for the reminder! You really made it come to life. Guess I best get to the store and pack in a few groceries. Sounds like round 3 might be a bit heavier. Keep warm. Thank you for showing it to me. I hope you will have lots of fun with the other ones too. Your right Carol, this image is so cute!! I love how you colored it and use Glossy Accents on it to make it stand out. Great choice of paper & sentiments. I love this! Carol, this is wonderful! Love the way you did the hearts! Adorable card! Super cute!!! Love those dimensional hearts! ABSOLUTELY BEAUTIFUL!! I love the image, great coloring! Great Creation! This is just precious and your granddaughter is sure to love it. That little pile of hearts is adorable and I can sure see the glossy accents...looks great. Don't you just love that wonderful zig zag chain punch? I saw Joanne/jojot use it and I just had to have it. Thanks for the link to these sweet digis.